The winter in sunny south Florida usually consists of a cool front descending down the Florida peninsula, bringing northwest winds with temperatures dipping down into the 50’s for a half-day. While this is technically “winter,” the advantage is the clear weather, sunny skies and warming temperatures these fronts bring behind them. 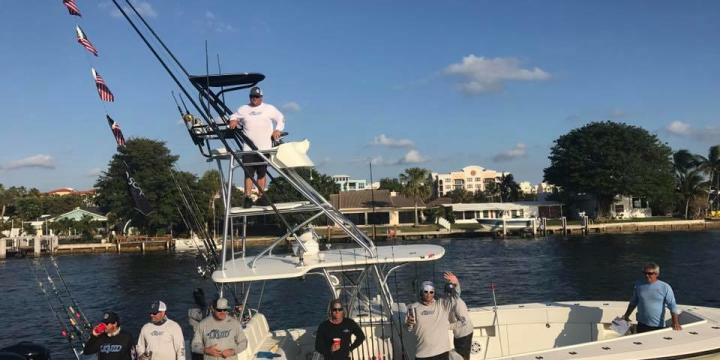 But these fronts also signal the billfish bite is ON, making the 7th Annual Billfish Tournament, held at Deerfield Beach’s Two Georges at the Cove, a very popular event. This year’s event turned out to be a great tournament with 16 boats fishing, benefiting the Deerfield Beach Boys & Girls Club-Jim & Jan Moran Unit. 65 Sailfish were caught and released plus 1 Blue Marlin caught By Crescendo! As you can see, there is an abundance of billfish in South Florida, especially in the winter! In this tournament, everyone wins … the billfish get released and kids of the Boys and Girls Club benefit from the fundraiser.